Goals measure how often audiences complete a specific action. Learn how to set up a goal and how to add a goal value. With goals, you can track how often each audience completes a specific action. Additionally, you can give your goals a monetary value. Goals are tracked for all of your website visitors. On your Insights page, you can see how often a goal has been reached by each audience and how much additional value you have generated through personalization. The image above shows how three audiences perform for the goal "book a demo". If you haven't set up a goal yet, Unless will suggest some goal recipes to you. A goal can be triggered based on page viewed, also referred to as destination URL. To set up a goal, give it a name (e.g. 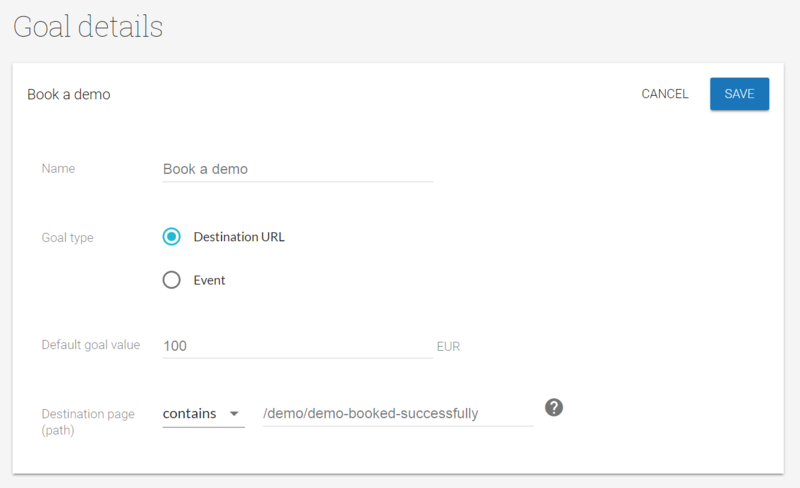 "book a demo"), define a type (e.g. lead), give it a monetary value, and set the page path (e.g. demo/demo-booked-successfully). You can set the page path using the condition "contains" or "equals". The image above shows how we set up the goal "book a demo". We gave it a value of 100€. In general, we recommend using the option contains. It will ignore all URL parameters your website might add to the page path. Example: demo/demo-booked-successfully?12345678. This option is recommended if you're familiar with tracking events via Google Tag Manager. You can either create a new custom tag or add the script to an existing tag. 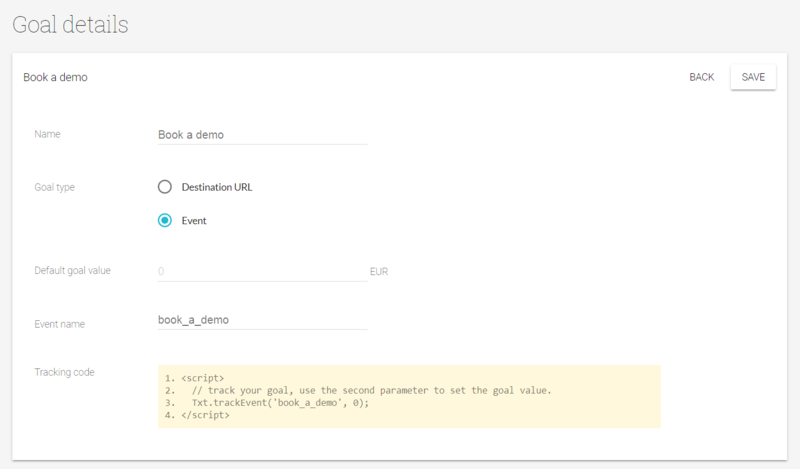 Ask your developer to add the goal script to your website. Optionally, you can set a monetary value for goals (the currency in which the goal value is displayed can be changed under account settings). Goals based on destination URL have a fixed goal value. With event-based goals, you can send dynamic goal values (e.g. basket value) to Unless. The setup process for dynamic goal values differs for each website but your developer will be able to do it in just a few minutes. 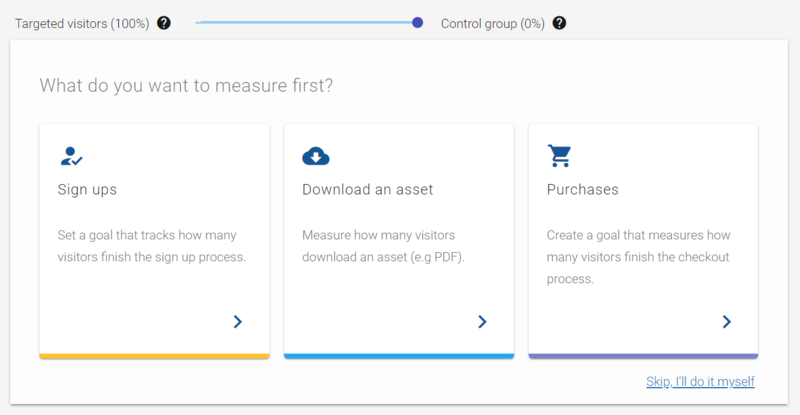 The control group tracks how often visitors who haven't seen your personalizations achieved your goals. The control group can be set on a site-wide level (not separately for each goal). This assures that the visitor experience remains consistent - they either see personalizations or they don't. The goal data is displayed on the Insights page. Learn more.